Not only am I feeling crushed by the usual holiday stress, and the cookie (almost) debacle of last week, but it is also suddenly persimmon season! This is a good thing (I keep reminding myself), as I find myself blessed with fruit from a friend's tree. I will blog tomorrow about the drying process, which has me busy during my waking hours, using my dehydrator to preserve this seasonal bounty. I had almost given up on it this year, except Teddy asked me if I was planning to dry any persimmons? I am the most avid persimmon fan in the house, and it helps motivate me when Teddy reminds me that he likes them too. Especially the dried ones. Today, I want to share with you all why I am particularly fond of persimmons--especially the much-maligned Hachiya variety. These pointy- bottomed fruit are not ripe until they are completely mushy. The unaware would easily think they had spoiled. This link has a clear photo if you scroll down. I totally understand how some people can be turned off by it. I am the only one in my family who can tolerate hachiya's mushy ripe texture--but I LOVE it. I have had this before!! It had been 16 years since I had left Korea as a 6-year old heading for my adoptive family. 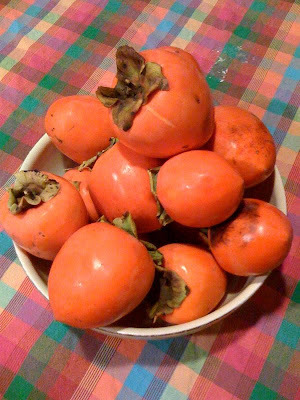 During those formative years, I am quite certain I was never within 10 miles of a ripe hachiya persimmon. And yet, eating that fruit in Seoul with my friend, I knew for certain that it had been a favorite food when I was under 6-years old. At the time, I was totally blown away by this experience, and eager for more "sense" memories to reconnect me to my roots. Retelling the story now, I am getting teary-eyed. Now you know why I love persimmons. I LOVE this story...but it reminds me of another you have--tell us about the rose petals!! And no, those squishy, mushy persimmons are alllll yours!